The RLS Foundation offers a network of certified RLS Quality Care Centers (QCCs) around the U.S. and Europe. These QCCs are renowned for their outstanding performance in the field, and are staffed by leading RLS specialists who provide expert care and specialized disease management. Among these Centers is Vanderbilt University Medical Center, located in Nashville, Tennessee. Accredited by the American Academy of Sleep Medicine, the Vanderbilt Sleep Disorders Center has won a Five Star Excellence Award four years in a row for scoring in the top 10 percent of clinics in the U.S. for patient satisfaction. The Center offers specialized care for sleep apnea, restless legs syndrome, narcolepsy, insomnia and other general sleep problems. At the helm of this RLS Quality Care Center is Arthur S. Walters, MD, serving as QCC Director. Throughout his career, Dr. Walters has focused his research on sleep-related movement disorders. Additionally, as the founder and first chair of the International Restless Legs Syndrome Study Group (IRLSSG), he helped establish the universal clinical criteria for the diagnosis of RLS. He also played an integral role in the history of the Foundation, going back as far as 1992 when the Foundation received its nonprofit status. Dr. Walters was a key player in establishing and validating the first scale to be used for the measurement of RLS severity, a scale that is now the most widely used for measuring RLS severity in both academic and industry sponsored studies. He is currently serving as chair of the Foundation's Pediatrics Committee, and is also a member of the Opiate Committee. Vanderbilt’s location in Nashville makes it accessible to individuals in various regions of the U.S. that are seeking expert care in the treatment of RLS. The Vanderbilt Quality Care Center has one of the largest staffs of certified healthcare providers in our QCC network, and they treat both children and adults living with RLS. To make an appointment, call 1-615-936-0060. To achieve certification, Centers undergo review by the RLS Foundation's Scientific and Medical Advisory Board (SMAB), and must demonstrate a high level of expertise and experience treating restless legs syndrome. To learn more about the qualifications and how to apply, click here. The RLS Foundation is pleased to announce that Christopher J. Earley, MB, BCh, PhD, FRCPI, of Johns Hopkins Medicine, is the recipient of the prestigious 2017 Ekbom Award. Dr. Earley has been a passionate champion of our mission for many years. Through his medical practice, he has helped many with severe RLS manage their symptoms, worked on many important research advancements for RLS, and has been an outstanding leader of the Foundation's Scientific and Medical Advisory Board (SMAB), which he chairs. Dr. Earley also serves as co-director of the Johns Hopkins Center for Restless Legs Syndrome, the very first RLS Quality Care Center. "Dr. Early is committed to working with patients to find the best treatment program to manage their RLS so they can get back to enjoying life," Executive Director Karla Dzienkowski said. "Dr. Earley helps to drive the work of the RLS Foundation forward by ensuring that our programs fulfill our mission and goals of awareness, education and supporting research that will lead to better treatments and one day, a cure." The Ekbom Award is awarded to an individual for meritorious service to the Foundation. Dr. Earley was a member of the Medical Advisory Board (MAB) for 16 years, and also served as MAB Chair. In 2015, Dr. Earley became the first Chair of the new SMAB. "Dr. Earley’s work as both a RLS clinician and researcher give him a unique perspective and passion for the cause," Dzienkowski said. "I am thankful for his service and willingness to provide guidance, comment or feedback on issues surrounding the work of the Foundation." Past winners of the Ekbom Award include Drs. Art Walters (1999), Richard Allen (2000) and Michael Silber (2014), all of whom are active members of the SMAB. Other awardees include former Executive Directors Cate Murray (2001) and Pickett Guthrie (2008) - also a founding member - founding members Robert Balkam (2003) and Sheila Connolly (2005), Wayne Henning (2008) and New Hampshire Support Group Leader and former board member Roberta Kittredge (2016). Stay tuned for a full article about Dr. Earley and his contributions in the summer issue of NightWalkers. The RLS Foundation is made possible by generosity of the RLS community, and we wanted to take this opportunity to say THANK YOU! Without your continued support, we would not have made the strides that we have today. Your donations go towards supporting our Research Grant Program, cultivating our RLS support group networks, allowing staff to travel to globally-recognized sleep medicine conferences, revamping our website, spreading awareness via social media, and much more. Help us mark our 25th Anniversary on Saturday, June 17, by doing as many of these 25 things as you can to help us spread awareness, and ultimately find a cure for RLS! Have a great healthcare provider? Let us know, we’ll invite them to join our Healthcare Provider Online Directory. Buy on AmazonSmile and select the RLS Foundation as your charitable organization. A portion of eligible purchases goes toward finding a #Cure4RLS! Learn more about currently funded research on rls.org as we get closer to finding a cure! Email one word to info@rls.org and tell us in one word what the Foundation and your support group means to you. Thank you, thank you, thank you. We will continue to work as hard as we can for you, until there is a #Cure4RLS. The annual SLEEP Meeting, hosted by the Associated Professional Sleep Societies LLC (APSS), is a three-day conference that brings together the best and the brightest clinicians and researchers in sleep medicine. It is the leading world forum to present and discuss the latest updates in the field - and the RLS Foundation was there to give the RLS community a seat at the table. Restless legs syndrome was a popular topic in Boston this year, covered in a number of presentations. All Foundation staff members attended one particular course, "RLS Treatment Advances in Post-Mainly-Dopamine Era," moderated by the Foundation's Scientific and Medical Advisory Board (SMAB) member Dr. Richard Allen. A panel discussion and Q&A session followed the presentation, featuring Drs. Christopher Earley, Daniel Picchietti and Diego Garcia-Borreguero. Earley and Picchietti are also both active members of the Foundation's SMAB, while Garcia-Borreguero is a former member of the Foundation's Medical Advisory Board. Research conducted around iron, opiates, augmentation, and RLS and children were discussed. "The audience was engaged and many physicians asked the panel of experts about RLS treatment standards and findings to implement current standards for their practice," Program Coordinator Chiara Corey said. "The topic of prescribing opiates was frequently asked as many physicians expressed roadblocks on the legislative side that impact their patients." 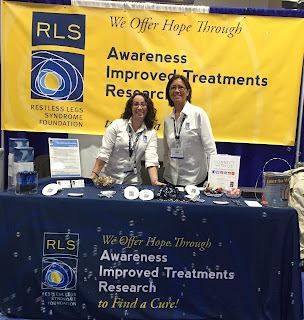 When they weren't attending sessions, Foundation staff were managing a booth in the Exhibit Hall of the Hynes Convention Center, distributing information about RLS to healthcare professionals and researchers. In fact, many healthcare providers were particularly interested in learning about pediatric RLS, scooping up multiple copies of the RLS Teen Guide and Children's Booklet that staff had available at the booth. "This year we had more clinicians who knew who we are and have sent patients our way," Chiara said. "Last year more physicians were just learning about who we are and what we do, and even seemed surprised we were there. We met many pediatric care providers and gave them the Children's Booklet and the link to the 'Kids & RLS' section of our website. We heard from researchers that were just beginning to get involved in RLS research, and we pointed them towards our research grant program. " The Foundation also used this gathering of sleep medicine professionals as an opportunity to hold the annual in-person meeting of its SMAB. During the meeting, the prestigious Ekbom Award was presented to Dr. Earley for his longtime dedication to the RLS Foundation and its goals. 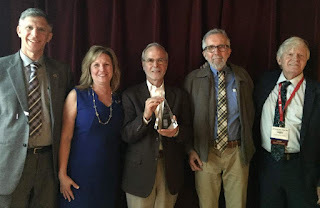 Additionally, Dr. Michael Silber, active member of the SMAB and chair of the Opiate Committee, was awarded the Outstanding Educator Award during the SLEEP Conference by APSS. Congratulations to them both! Next year SLEEP 2018 will be held in Baltimore, Maryland - we'll see you there! SLEEP 2017 was the 31st Annual Meeting of APSS, a joint venture of the American Academy of Sleep Medicine (AASM) and the Sleep Research Society (SRS). This annual meeting provides evidence-based education to advance the science and clinical practice of sleep medicine, disseminates cutting-edge sleep and circadian research, promotes the translation of basic science into clinical practice and fosters the future of the field by providing career development opportunities at all levels. Last month marks Program Coordinator Chiara Corey’s two-year anniversary at the RLS Foundation. Her areas of responsibility are many – from managing support groups, organizing webinars and Board of Directors meetings, to monitoring social media… It’s a good thing that she is the ultimate multitasker! “Chiara has a great attitude and is always willing to do whatever it takes to support the RLS community or her peers," Executive Director Karla Dzienkowski said. "I recognize and appreciate her dedication to the RLS Foundation." 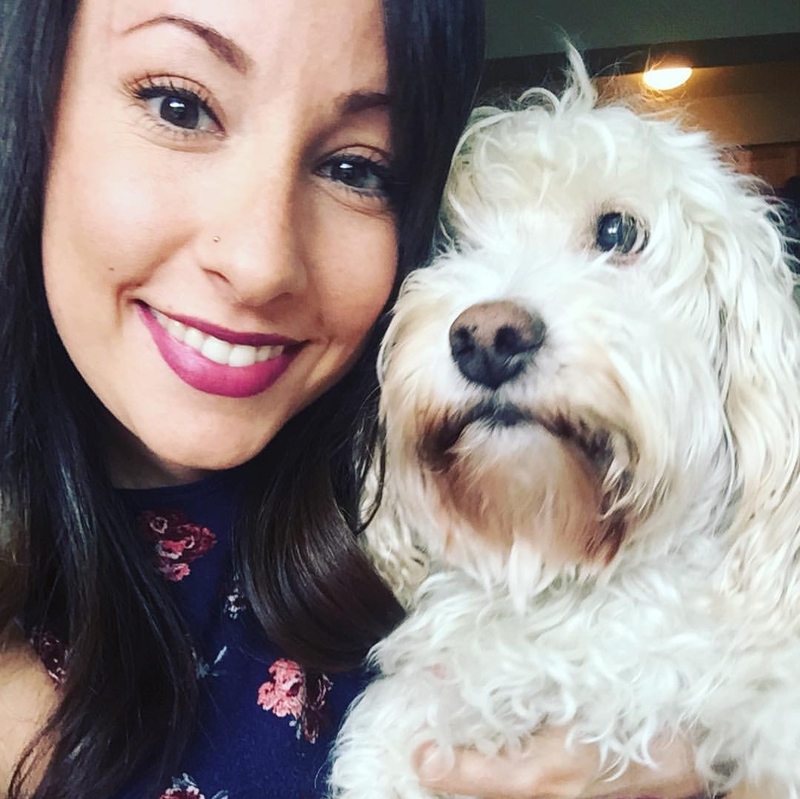 Chiara has a degree in communications, and is a Certified Surgical Technologist, which gives her a diverse background that includes marketing, public relations and healthcare; this gives her the perfect skillset to get it all done. If you’ve ever called the office and spoken with Chiara, you’ve experienced her quirky yet adorable Boston twang, as she is a transplant from the Boston/Rhode Island area. "Chiara is a lot of fun to work with," Membership Coordinator Faith Duncan said. "She is patient, reliable & smart, an excellent teacher, extremely compassionate with members, and has a super witty personality, which makes the office a great environment! I especially enjoy the moments when she breaks out into Italian or crosses her eyes at me!" Outside the office, her world revolves around Hunter, the extremely handsome, energetic & protective Shih-Poo she rescued many years ago; and Jeffrey, her adopted neighborhood cat. And in a former life, Chiara was both a musician and a dancer! While she doesn’t dance professionally any longer, you might still catch her singing or strumming on Facebook … if you’re lucky. Thank you for all of your hard work, Kiki! We love you!